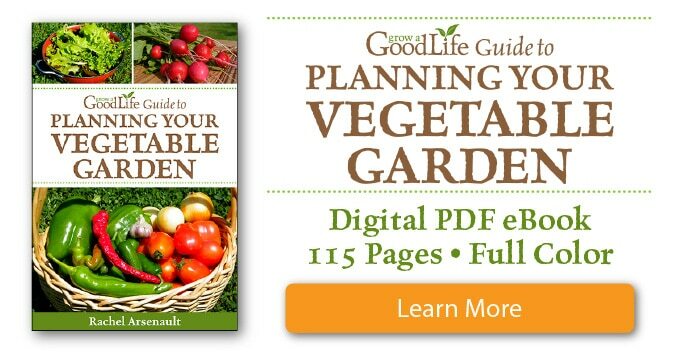 String beans are very productive and there are so many varieties to explore. 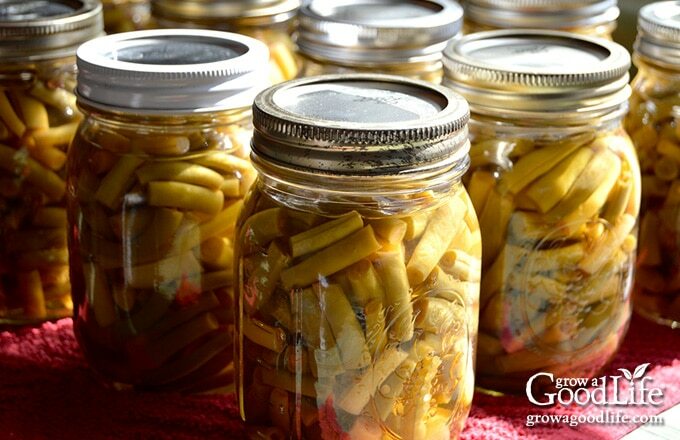 Preserve the harvest bounty by pressure canning green beans for food storage. Home canned green beans are safe, nutritious and good to eat if canned properly. 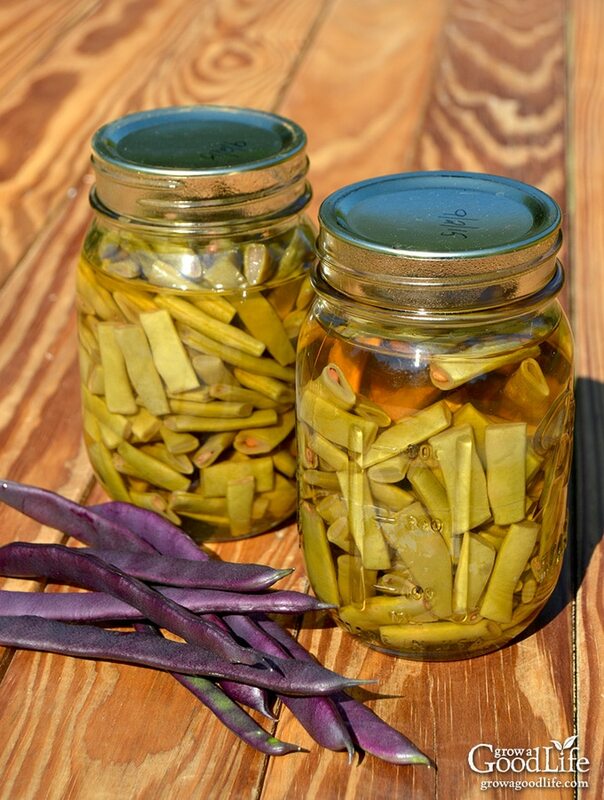 Read on for tips and recipe for canning green beans with a pressure canner. Freshly harvested string beans are one of my favorite vegetables. 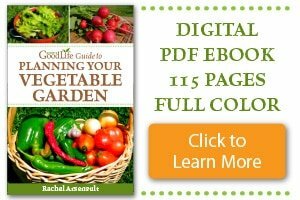 The first year I started my garden, I planted a lot of different types of bush and pole beans. I loved the different colors and shapes. I may have gone a little bit overboard. After eating my fill and giving a lot away, I blanched and froze extra to enjoy over winter. I was disappointed with the frozen string beans. I didn’t like the rubbery texture or the squeaky feeling they had on my teeth when I chewed them. I decided to try canning string beans instead. String beans must be canned using a pressure canner. The mission of canning green beans is what prompted me to invest in a pressure canner. Like carrots, string beans are a low acid food and can only be canned safely by using a pressure canner. I did some research and purchased the least expensive one I could find, Presto 16-Quart Aluminum Pressure Canner. It holds a canner load of 9 pint sized jars and I can lift a full canner load off the stove without help. Harvest your string beans in their prime when they are tender and small to medium sized. String beans grow quickly and I like to pick them every day so they don’t grow too big, but sometimes they get away from me. Select the small to medium sizes string beans for preserving. The large or seedy pods may taste ok when eating fresh, but they don’t hold up very well to canning and tend to get soft. 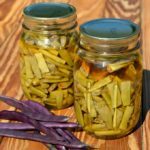 Aim for about 10 pounds of green beans per canner load: Harvest, wash, and store your string beans in zipper bags for a few days until you have enough for a full canner load. I like to aim for about 10 pounds to fill 9 pint sized jars. Canned string beans can be prepared quickly for meals. Since pressure canning cooks them, they only need 10 minutes on the stove to heat up. Canned string beans are also easy to add to add to soups. Add the whole jar at the end of the cooking time and boil for at least 10 minutes. Take the time to allow your pressure canner to cool down naturally. Don’t rush the release of pressure by venting or removing the gage. Doing so may cause the liquid to siphon out of your jars. Label and date your jars. I use a permanent marker to write the contents and date on the jar lid. This works for my storage pantry but doesn’t look very pretty when giving away jars as gifts. Here is an easy way to Remove Ink from Jar Lids. If you have never pressure canned before, it may be helpful to review Using Pressure Canners at the National Center for Home Preservation website along with the instructions that came with your pressure canner. Rinse the string beans under running water, remove the strings, trim ends, and snap or cut into 1-inch pieces. Wash the canning jars and lids in warm, soapy water, and rinse well. Place the jar rack into the pressure canner, set the jars in the canner, add water, and boil jars for 10 minutes to sterilize. Warm the lids in a small pot over low heat. Keep jars and lids warm until ready to use. Also, bring a large pot of water to a boil over high heat. This will be the water you’ll use to fill the jars of string beans. Remove the warm jars from the pressure canner, drain, and line up on a kitchen towel. Pack the prepared string beans into jars leaving 1-inch head space. Pack them in tightly, because they will shrink a bit when processed. Add canning salt if using. Ladle the boiling water from your large pot into the jars over the beans maintaining 1-inch headspace. Remove air bubbles with the bubble popper, wipe the rims, and add your lids. Using the jar lifter, place jars carefully into pressure canner. Once the canner is full, adjust the water level per your pressure canner’s instructions. If adding water, use the hot water from your large pot. Bring the canner to a boil. Follow the directions for your pressure canner and process the jars. Let the canner cool, remove the jars, and let them cool completely. Date, label, and store in a cool location. Prepare your string beans by rinsing, remove string, trim ends and snap or cut into 1-inch pieces. Wash your jars and lids in warm, soapy water and rinse thoroughly. Place jar rack into pressure canner, set jars in the canner, add water to the jars and fill canner to around 3-inches. Cover and and boil jars for 10 minutes to sterilize. Add lids to a small pot over low heat to soften the seal. Keep jars and lids warm until ready to use. Fill your large pot with fresh, clean water and bring to a boil. Keep warm until you are ready to use. Spread a kitchen towel on your counter. Use your jar lifter to remove warm jars from the canner, tilt to drain the water back into the canner, and line up the jars on kitchen towel. 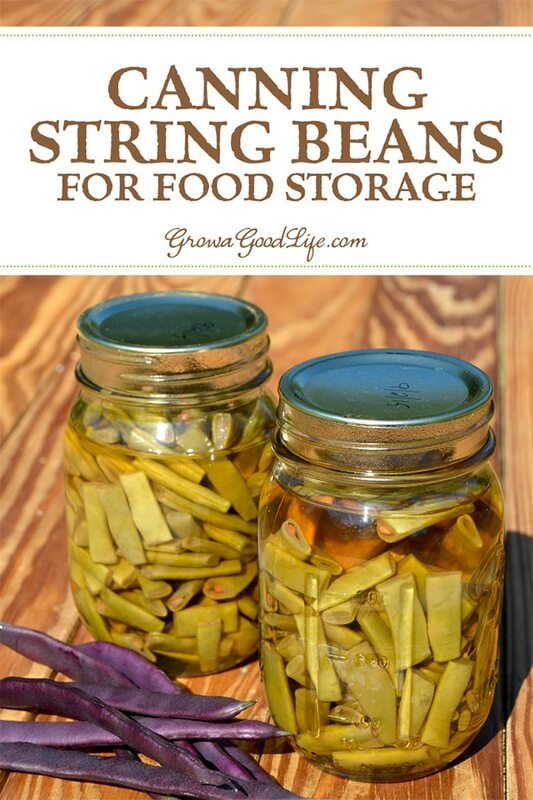 Use the canning funnel and raw pack the prepared string beans into the jars. Try to pack them in tightly while leaving a 1-inch headspace. If you are using canning salt, add 1/2 tsp per pint jar. Ladle boiling water over string beans and fill the jar maintaining the 1-inch headspace. Remove air bubbles with the bubble popper and wipe rim. Use your magnetic lid lifter to lift lids out of the warm water, center lid on jar, and screw on band until it is fingertip tight. Using your jar lifter, place the jars carefully into pressure canner leaving space in between them. Once jars are all in canner, adjust the water level per your pressure canner’s instructions. If adding water, use the hot water from your large pot. Close the pressure canner and secure the lid. Leave the vent open, adjust the heat to medium-high, and bring the canner to a boil. Allow the pressure canner to vent for 10 minutes, then place weight on the vent. Allow the pressure to reach 10 pounds and process pints for 20 minutes at altitudes of less than 1,000 ft. Follow the directions for your pressure canner and adjust processing time for your altitude if necessary. When processing time is complete, turn off heat and allow pressure canner to cool down on its own (approximately 1 hour). When pressure canner is cooled down, spread a kitchen towel on counter, unlock cover and remove it by tilting lid away from you so that steam does not burn your face. Allow a few minutes for the jars to adjust to the change in pressure. Use a jar lifter to lift jars carefully from canner and place on towel. Allow the jars to cool for 12 to 24-hours. You should hear the satisfactory “ping” of the jar lids sealing. After 12 to 24-hours, check to be sure jar lids have sealed by pushing on the center. The lid should not pop up. If the lid flexes up and down when center is pressed, it did not seal. Refrigerate jar and use up within a few days. Remove the screw on bands and wash the jars. Label and date the jars. Store your jars in a cool, dark place and use within 12 months. Yields 9 pints. Last night my husband and I canned green beans using a pressure cooker for the first time ever… We used to freeze them , but like everyone else, we experienced the rubber texture and not so good taste. Being rookies with using a pressure cooker for the first time, I’m not real sure we did it right, being that the pressure cooker wasn’t working properly but our jars are sealed. So my question is, how do I know our beans are safe for our family to eat? My grandma’s canned green beans won ribbons at the Hardin County fair . . I sure wish I knew her secret!!! oh, I’m with you on the frozen green beans. And yet, in my hurry this summer, I froze some because I was tired. I served them last night and no one ate more than one bite. I really need to remember this lesson.